WTAMU Interface - CIS 4372 HCI and Data Viz. The WT website can be used for may things for a broad range of users. The users that utilize the website are WT students, faculty members, employees, and the general public. This large range enables the website to have a wide scope of information usable for most users. Is consistent 3 The WTAMU Website is getting better updating the entire website collaborating all the formats and schemes, but within different departments I find old layouts that need to be updated. Caters to universal usability 3 The interface does an acceptable job for universal usability but the interface is mainly made for WT students and faculty. Outside people may not be familiar with the format initially. Offers informative feedback 4 For the correct user, students, faculty, and people outside of the university interested in WT can found plenty of information on several issues and concerns. Provides dialogs that yield closure 3 The website really does not provide any warning prior to closing down any part of the website unless entering your email or Buff Advisor which are external to WTAMU website. Prevents errors 3 The interface is mainly used to retrieve information. As far as filling out forms for submission to receive information about something, the website does provide enough checks to make sure all fields are filled in with no missing data. 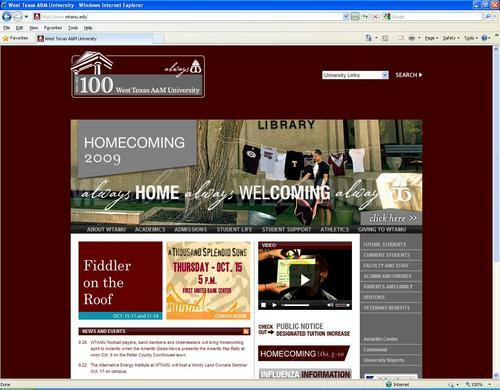 Permits easy reversal of actions 4 A user can easily press back or go to the WTAMU homepage at anytime while browsing. Offers support for internal locus of control 2 Really the interface offers no support for the user at anytime while browsing. Reduces short-term memory load 3 The interface very seldom needs the user to remember anything, since the website is a information based site.